In addition to creating standard discounts with Revel, you can also create specific discounts like Volume-Based Discounts. Volume-Based discounts are based off the quantity of products purchased. Examples include Buy One, Get One Free; Buy Two, Get One Half Off; and Buy Five, Get 25% Off Each. In the Management Console ([yoursubdomain].revelup.com), navigate to the Products tab and click Discounts from the left side. Your Type will be dependent on your BOGO Discount. Choose Amount if you give a whole dollar amount off for purchasing a certain quantity of a product, such as $5 off with the purchase of 2 pairs of shoes. Choose Percent if you give a percentage off for purchasing a certain quantity of a product, such as 15% off with the purchase of 3 T-Shirts. Choose Reprice if you reprice specific items to the same dollar amount for purchasing a certain quantity of a product, such as buy 4 of a $25 accessory to receive each for $20. Choose Alt Price if your BOGO items are repriced to various amounts. The alternative price must be set per each item in the Advanced Product Details. Fill out the Amount of the BOGO discount depending on your chosen Type. For the Qualification Type, select Item since this is a product-based discount. After Item is selected, another box will appear to the right. From here, choose Class, Group, Modifier Class, Modifier, or Product. Once selected, you can then choose which specific class, group, modifier class, modifier, or product the discount is based on. For example, if all of your jewelry qualifies for your BOGO offer, you would first create a product group that contains all of your jewelry and then choose the group in your discount. Next, check the Auto Apply box if you want the BOGO discount to automatically apply if the criteria is met. Check the Taxed box if your BOGO discount should be taxed. In the Discounts page, click the pencil icon to the far right of your BOGO discount. In the discount details, scroll down to the Advanced Discount Rules. 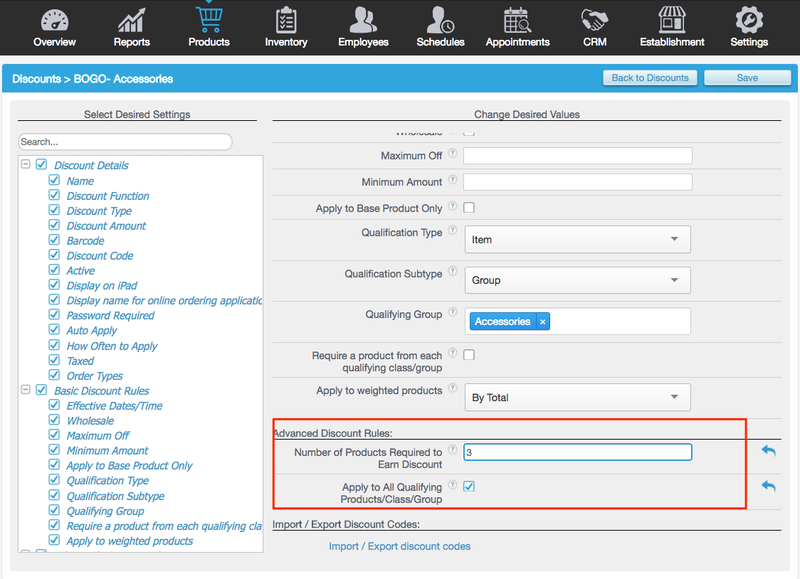 In the Number of Products Required to Earn Discount field, enter the number of products required to earn the discount. For example, if your BOGO is buy 3 candles, get the 4th for free, enter 3 in this field. 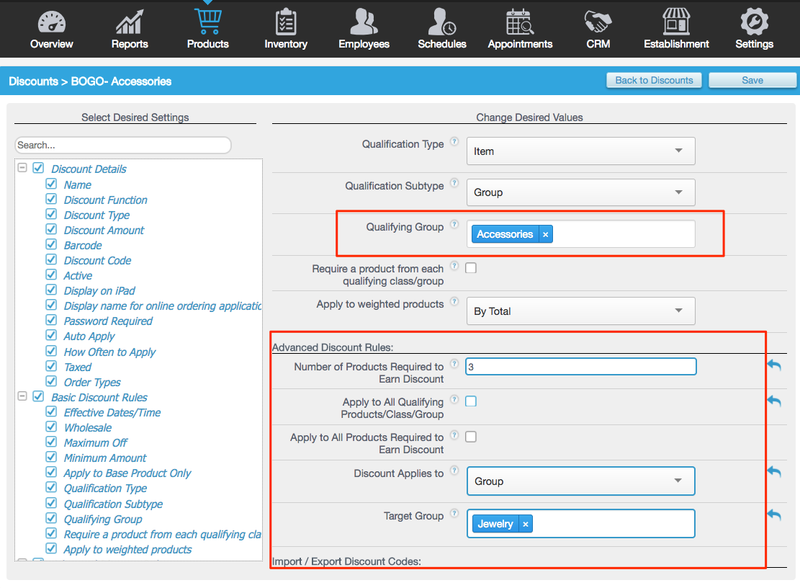 Lastly, in the Discount Applies To field, leave it set at Same as Qualifying Product/ Group/ Class if the discount applies to the same product, class, or group that was required to meet the discount. For instance, buy 2 swimsuits, receive a 3rd swimsuit free. If the discount applies to a different class, group, modifier, modifier class, or product, click the drop-down and choose Class, Group, Modifier, Modifier Class or Product. 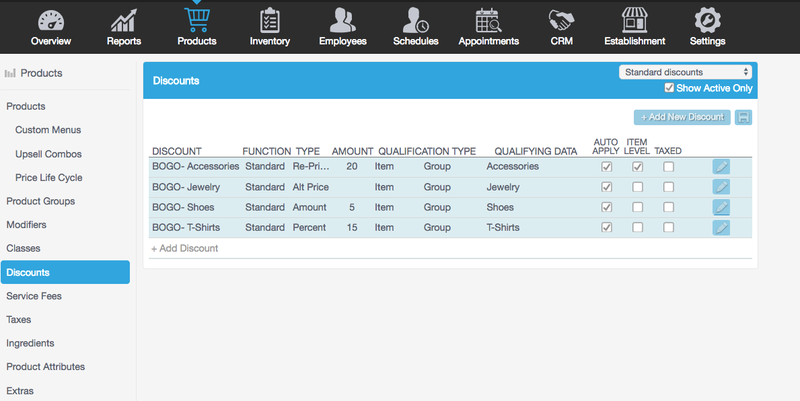 Once selected, fill out the Target Class, Group, Modifier, Modifier Class, or Product. This would be used if you were offering a discount such as buy 2 swimsuits, receive a beach tote for free. Once all details are filled out, click Save in the top right corner to save your changes.